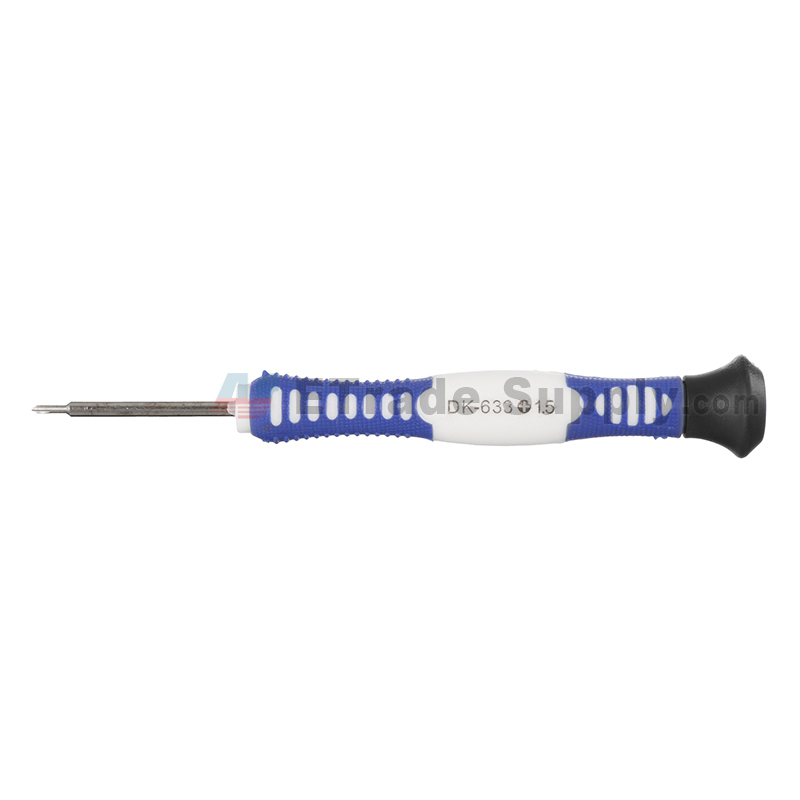 Home » OTHERS » Did you pick the right screwdriver to repair iPhone? Have you ever repaired an iPhone? If you have done this before, you may find that there are so many different size of the iPhone screws. Put all these screws back in the right place should be important when you reassembling the iPhone, cause if you don’t, there will be a big risk damaging your phone. Now we’re going to reveal all the iPhone screws to figure out what exact screwdriver you really need when repairing the iPhone. First we’ll start from the 2 outer screws at the bottom near the lightning dock connector, these 2 are Pentalobe screws, which is 5-point tamper-resistant screw used first by Apple to secure the battery in the MacBook Pro, there you’ll need a P2 Pentalobe screwdriver, which is 0.8mm size, to undo these 2 screws. 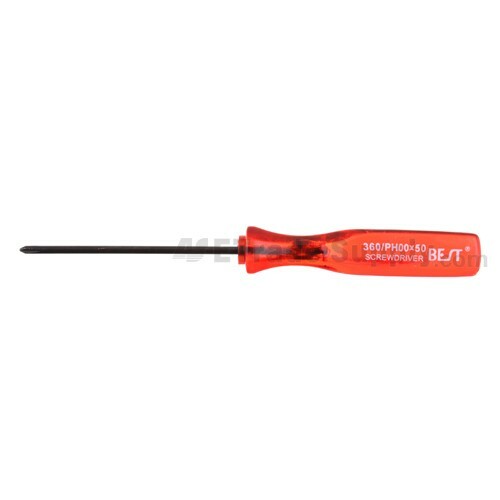 Although different iPhone features different length of the Pentalobe screws, still they can share the same P2 Pentalobe screwdriver. 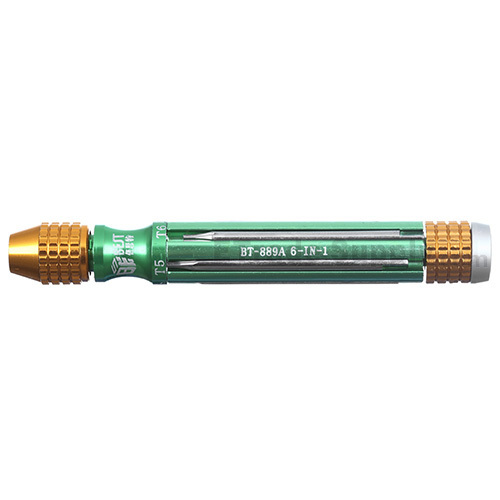 Tips: Many people complained that the Pentalobe screws are prone to stripping even with the right screwdriver, use smaller Phillips screwdriver to put those back will be more convenient compared with using Pentalobe screwdriver. What’s more complicated are the inside screws, you may think that all the screws inside are Phillips screws, well, that may not corrected. There are still many special screws inside. 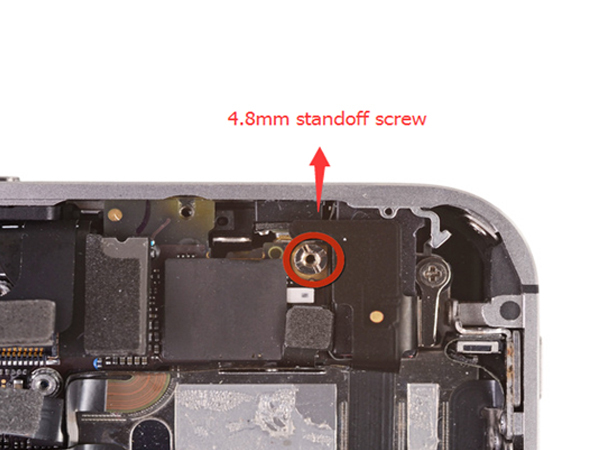 For iPhone 4, except for the Phillips screws, there is a 4.8mm standoff screw inside, near the headphone jack. 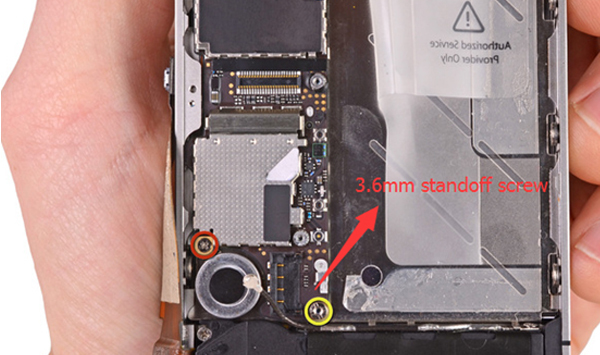 While for 4S, there is one more 3.6mm standoff screw along beside the logic board near the battery connector. 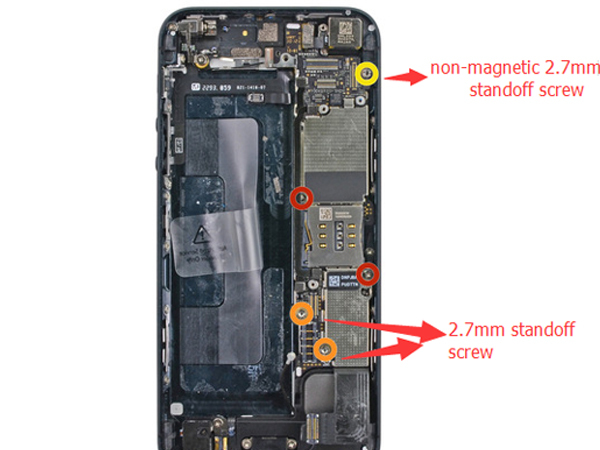 For iPhone 5, you can see that there are 3 standoff screws size 2.7mm which securing the logic board to the rear housing, the top one is non-magnetic and the other 2 are on the bottom side near the battery. 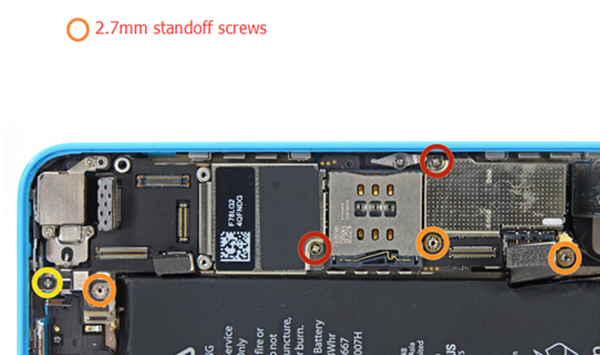 For 5S, there are four 2.8mm standoff screws when you disassemble the logic board. 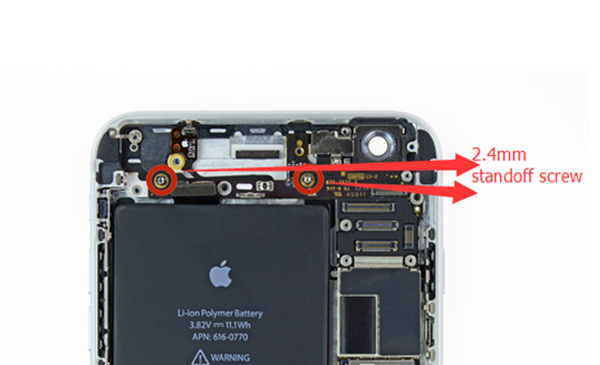 As for iPhone 6, there is a 2.3mm standoff screw on top right of the battery, while 6 Plus has 2. 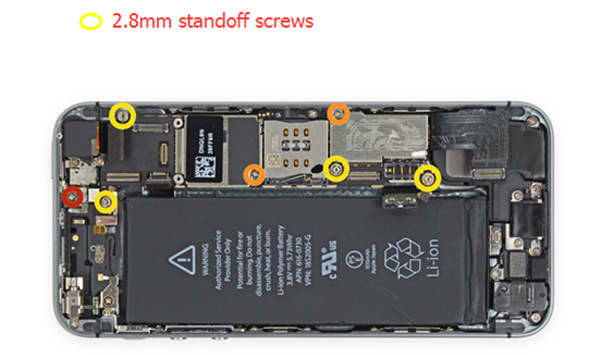 Look at new iPhone 6S Plus, unsurprisingly there is still a 2.2mm Phillips standoff screw securing the logic board. Even with the small size iPhone SE, which also features four 2.8mm standoff screws like 5S did. Here we can see it clearer from this picture below about the differences between normal Phillips screw and standoff screw. The standoff screw looks like Phillips screw in some way, however there is a sunken hole within the screw and four flutes on the edges are also different from the normal Phillips screw. 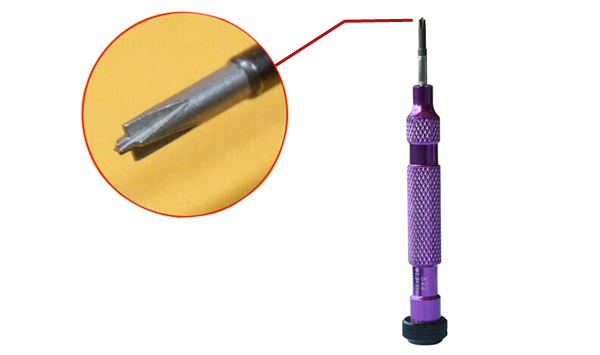 So there you should get a special screwdriver like this one to undo the standoff screw. 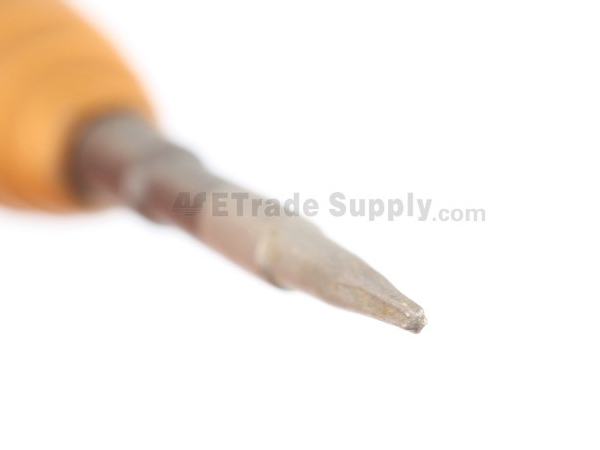 Tips: you can undo the standoff screw with a 2.5mm flathead screwdriver if you don’t own a special standoff screwdriver. 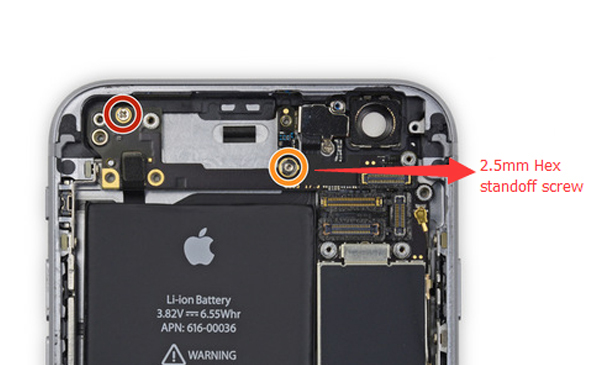 And for the iPhone 6S, it is a little bit different, the special screw is located on the top right of the battery, which is 2.5mm Hex standoff screw. 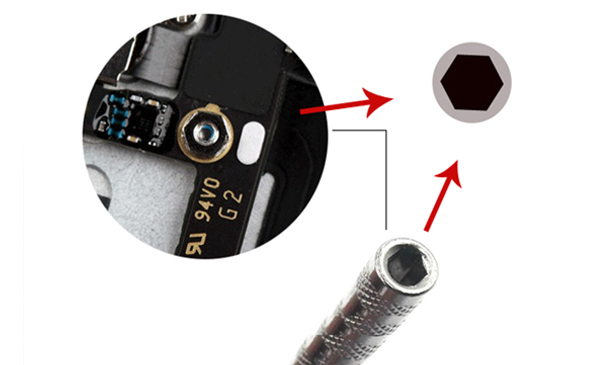 So when you disassemble the iPhone 6S, you’d better prepare the special M2.5 Hex socket screwdriver, otherwise it’s so hard to take out this unique screw. Except the special Pentalobe screws and standoff screws, the left are all normal Phillips screws. Though these screws are in different length, luckily they can share the same Phillips screwdriver when you disassemble your iPhone. 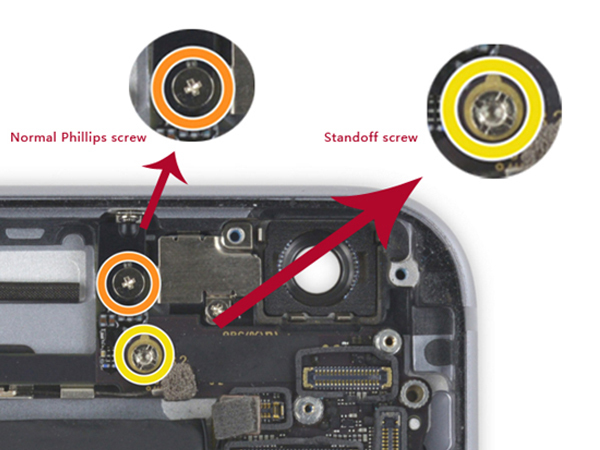 However, we’d like to mention that from iPhone 4 series to the 6 generations, the Phillips screws are changed a little bit. For iPhone 4/4s/5/5C/5SE, you’ll need the Phillips#000 screwdriver while the iPhone 6/6 Plus/6S/6S Plus requiring the Phillips#00 screwdriver. 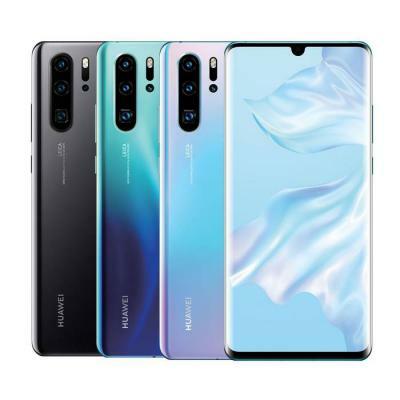 When disassemble the screws, keep all of them organized (we suggest to use the magnetic screwmat), cause if you mixed them up, like if the screws get swapped and one of the longer screws is placed in the hole for the shorter it will damage the logic board, causing the phone boot loop, display a blue screen or showing error 14 or error 9 etc. 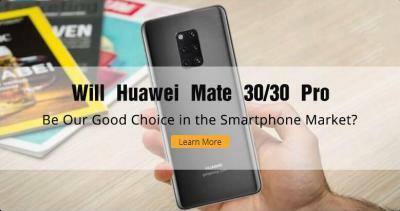 Also over-tighten the screw will damage the phone either. 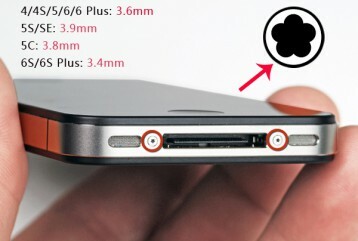 So if you have any questions or any ideas about how to deal with iPhone screws easier, do not hesitate to share with us! I found your article quite interesting. My iPhone 6 plus SIM tray is stuck solid and cannot be removed with the special tool used to push in and release the tray. 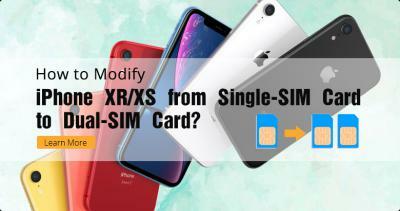 If I remove the two screws at the bottom of the phone and open the phone, what do I have to do to release the SIM card tray? Please respond. Thanks. Here is the video tear down iPhone 6,please can you visit it: https://www.youtube.com/watch?v=jeoLRnsvygw,may this video can help you,have a good day!! could you update this for the 7 and 7 plus please?